I tend to use the monopod mostly for telephoto shots. In the past, I tried mounting a ball head on the pod, but was never comfortable with the set up, especially for vertical shots. So, I've switched to using a tripod ring instead. And I have to tell you, I am so much happier. 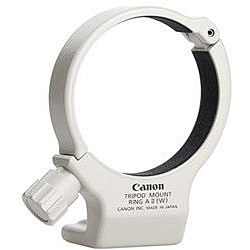 I use the Canon Tripod Mount Ring A II (W) for my 70-200mm f/4L zoom (often with the 1.4X extender). First of all, the tripod ring is much lighter than an equivalent ball head. The camera is definitely more balanced on the monopod. And I don't have to buy an additional quick release because the ring serves that purpose. And the added bonus... no quick release plates to fool with. The joy gets even better while shooting. I absolutely *hate* trying to shoot vertical shots with a ball head. The slot is never in the right place, and I feel like the camera is about as unbalanced as it could possibly be. But with the tripod ring, I just loosen the knob a half turn, rotate the balanced camera to any angle I want, and tighten slightly. It is wonderful. Once you use a tripod mount ring for your telephoto, you will never go back. Ah but if you combine that with a ballhead on your tripod or a Monopod head on your monopod (check out the Manfrotto monopod head 234RC), then you're really cooking! The monopod head is really intended to allow you to flip your camera from landscape to portrait, but if you turn it by 90 degrees then you can use it to tilt the camera up and down instead of having to swing the whole monopod forward and back. Using it this way in combination with the tripod ring makes a monopod a really useful item!